Can it get any better? Not only do we have a train car, but a train car and a ginormous alligator. 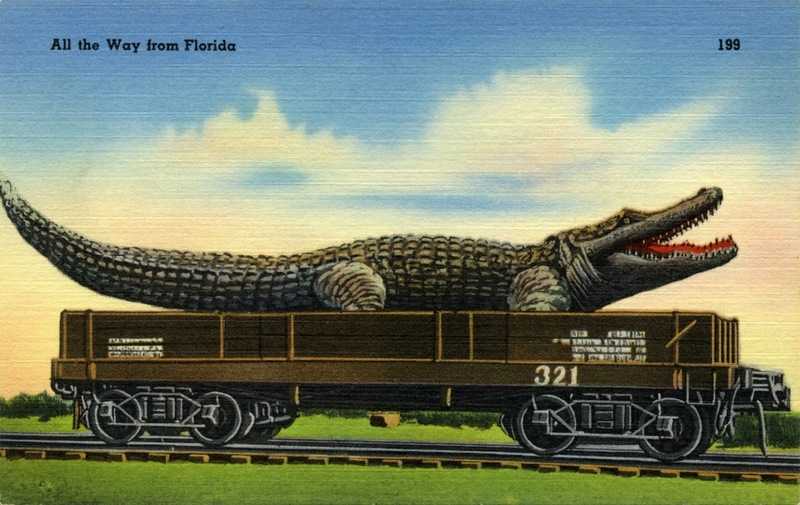 An alligator so big, its tail doesn't even fit on the postcard. There are loads of old linen postcards with really big, exaggerated sized things on trains, trucks, carts, tractors or whatever may be used to haul big stuff around; popular subjects usually were big pieces of fruit or vegetables, but fish stories abound as well. The idea being, "We grow 'em and we grow 'em really big down here in [your state or city here]. Come on down and visit us to see the wondrous sights." I relish these visual jokes and hope to share more in upcoming posts.